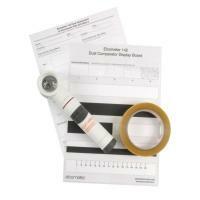 The Elcometer 142 Dust Tape Test Kit allows assessment of the quantity and size of dust particles on surfaces prepared for painting. Dust on blast cleaned surfaces can reduce coating adhesion, leading to premature coating failure and sub-standard coating finish. The kit can be used in accordance with the recommendations of BS EN ISO 8502-3 either as a pass/fail test or as a permanent record of the presence of dust. Supplied in a carry case for use in the field to assess surface cleanliness.